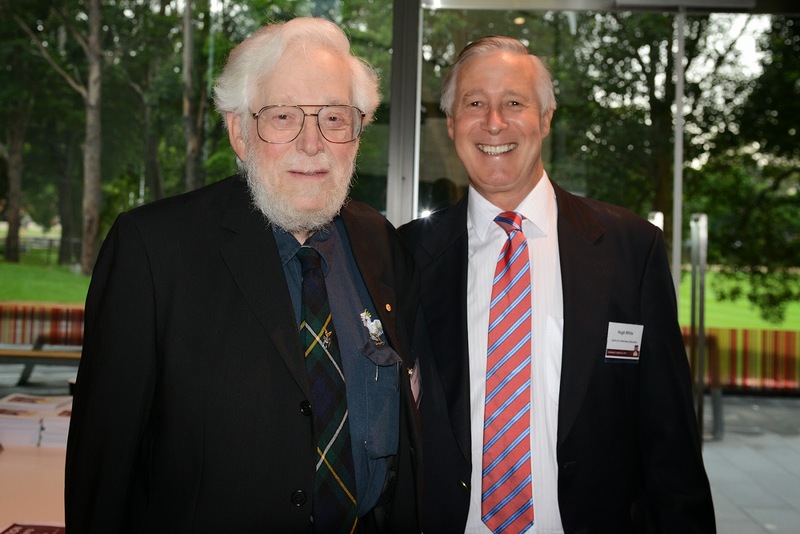 Dr James Harris OAM with Dr Hugh White of the Centre for Veterinary Education at the first Australian Zoobiquity Conference. Dr Harris was a driving force behind the conference. How long is the average veterinary career? Figures vary, but at one stage it was about five years. The same time as it takes to become a veterinarian – at least in the traditional Bachelor of Veterinary Science program. So it’s always interesting to hear from people who have stuck it out in practice. Dr James Harris is based at Mayfair Veterinary Clinic, Sandy Bay, Tasmania. He was awarded the Order of Australia Medal in 2013 for services to veterinary science and animal welfare. He’s been a veterinarian since 1958. He has two fulltime jobs: the practice, which he owns and operates, and his farm, which is home to chickens (whose eggs he sells at the practice), pigs, 50+ geese, two turkeys, indian runner ducks, 2 Clydesdales, 11 sheep, 12 alpacas, one goat, three dogs, a cat and a very understanding Mrs. He is the sort of guy who, after a long day consulting and calling clients for progress reports, just before he closes the practice to go home and tend to the animals, is happy to ring a colleague and talk shop. It was interesting to hear his views on the profession, particularly in light of high rates of suicide, stress and burnout. Dr Harris says he doesn’t find being a vet stressful. Dr Harris says that curiosity is one of the most important traits in a veterinarian. Biologists discuss holding capacity: The population of a species that an area can support. This is applied to every species but one, Homo sapiens. And we continue to take over more and more of the land mass of this planet with devastating effects on the other species with which we share this planet.